The St. Patrick's Festival in Killarney is a celebration of Ireland's national holiday with events for all the family to enjoy. Killarney Mountain Festival is a celebration of the wonders of the hills and mountains of the outdoor adventure capital of Ireland. The ultimate guide on things to do on a rainy day in Killarney. Christmas in Killarney: A festival for all the family. For many people, the Gap of Dunloe trip is the ultimate way to experience the best that Killarney has to offer. Killarney hosts a day long celebration of all things American on the 4th of July. 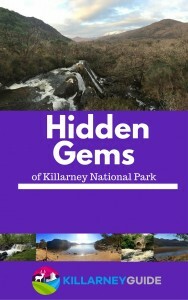 Killarney House and Gardens - A portal to the wonders of Killarney National Park. Gaelic Roots : The Show - An exciting Irish Music, Song and Dance live show in the heart of Killarney. Ross golf course is a compact and charming parkland course located within walking distance of Killarney town centre. Innisfallen is a magical, special place that needs only a couple of hours of your time. In return, you will be rewarded with an enchanting experience that will linger with you long after you leave the island. *****COMPETITION CLOSED*************Win dinner for two in the award winning Yew Tree Restaurant at Muckross Park Hotel & Spa, Killarney. The Muckross boat trip - a fabulous trip from the Old Boathouse of Muckross House to Dinis Cottage under the slopes of Torc mountain on Muckross Lake. Killarney parkrun - A timed 5km run through the Muckross area of Killarney National Park. Every Saturday at 9:30 am at Muckross Traditional Farms. Enjoy this scenic Killarney House 5k run route from the 'Golden Gates' around the Knockreer area of Killarney National Park. Experience the magic of Muckross on the Muckross Gardens 5k running route through some of the best loved parts of Killarney National Park. A 5km running route around Muckross House and Abbey through some of the most popular parts of Killarney National Park. Experience the magic of Muckross in 5km! Discover 5 of the best 5k runs in Killarney National Park. Parkland paths, lakeshore trails and woodland tracks around the shores of the Lakes of Killarney. ****COMPETITION CLOSED***** Enter to win a Kayaking Adventure for 2 on the Lakes of Killarney with Outdoors Ireland.